A new report from the American Association of Physicists in Medicine finds the x-ray scanners at US airports are safe (even though they're still a little creepy). 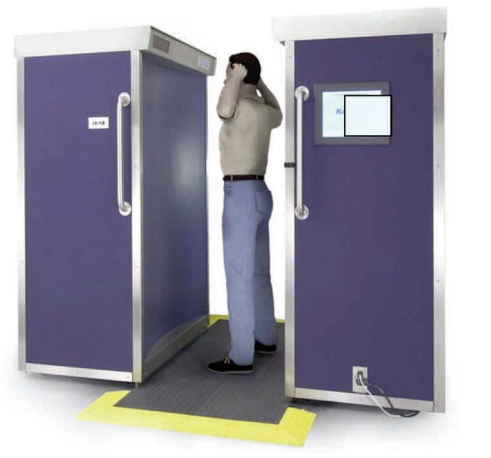 Ever since Physics Buzz blogger EchoRomeo took a look at the open questions surrounding airport security x-ray scanners back in 2010, I've made a point of refusing to submit to x-ray scans when I travel. Instead, I've opted to get familiar with many of the wonderful TSA officers trained in (literally) hands-on screening methods. It now appears that those awkward moments staring at the ceiling and thinking of England were probably unnecessary, according to a new AAPM report. To agree with one of the developers' dodgy claims, Shark Wheels really are a revolution in wheel technology. By "revolution," I mean their products tend to revolve around a central axis. Outside of this simple prerequisite for the word "wheel," I can't see much advantage these wobbly-looking things would provide over the 5,500 year old tried and true "circle" models. The skateboarding world is rife with market-minded inventors promoting gimmicky products to children. Every now and then, however, some of these products find their way into mainstream acceptance. Thanks in part to a highly successful kickstarter campaign, one LA-based startup has already begun production on their Shark Wheels, advertised as the SQUARE skateboard wheel that shreds! As a lifelong skateboarder with a physics degree, I found the initial claim suspect. I seem to remember most wheels I've encountered as having a much rounder shape, but one look at the kickstarter page will suggest that these Shark Wheels are squares, circles, cubes and sine waves ALL AT THE SAME TIME. The most recent Superman movie notwithstanding, there seem to be a lot of mad scientists out there, and in this week's podcast I interviewed James Kakalios, author of "The Physics of Superheroes," as to why that is, and why they particularly like to pick on Superman. (ISNS) – A team of Japanese and South Korean researchers has devised a means of making solid walls virtually transparent to sound. The process relies on drilling small holes in a rigid material, such as a wall, and covering them on one side by a membrane made from the plastic wrap found in any kitchen. "The wall with the bare holes seriously hinders the transmission," the team reported in the June 13 issue of Physical Review Letters. "[B]ut with the membrane installed the transmission becomes, as expected, almost as good as with no wall." If you gazed toward the night sky this weekend, you may have noticed that the full moon looked a little bit brighter and bigger. That's because this full moon occurred while the moon was at its closest distance to Earth — its perigee. As the moon revolves around the Earth, there's a relatively small fluctuation in the distance between the two bodies. The moon doesn't revolve in a perfectly circular orbit; instead, it has an elliptical orbit just like the Earth's orbit around the sun. During yesterday's perigee, the moon was 221,824 miles away compared to a 252,581 mile stretch at its most distant point. NASA estimated that this year's supermoon would be up to 14 percent brighter and 30 percent larger than a typical full moon. For your lunar enjoyment, we've rounded up some of the most eye-catching snapshots of this past weekend's supermoon from around the world. 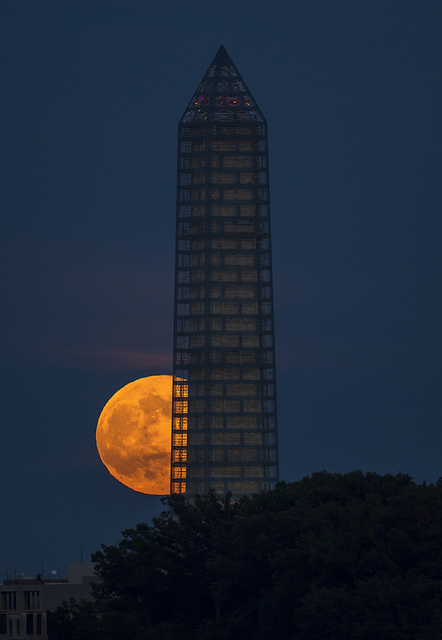 The supermoon rises behind the Washington Monument on June 23, 2013. 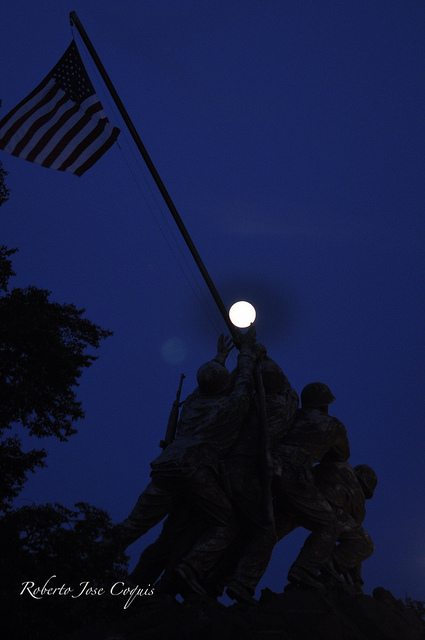 The supermoon rests in the hands of soldiers at the Iwo Jima Memorial at the Arlington National Cemetery on June 22, 2013. 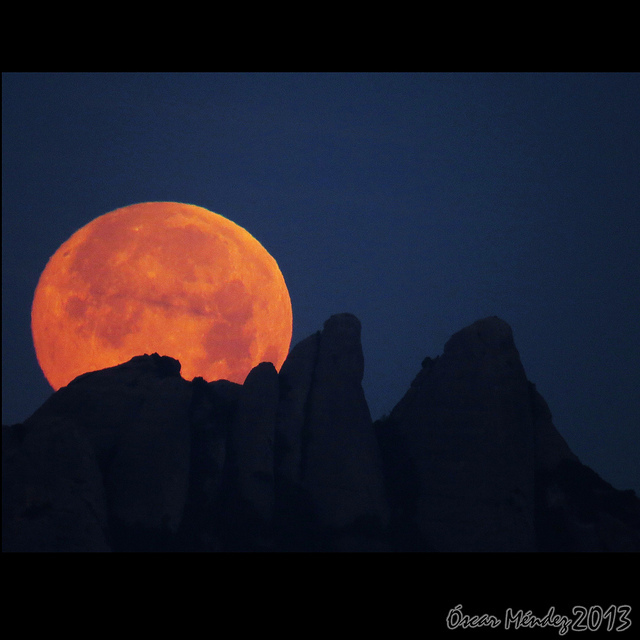 The orange supermoon tops Montserrat in Spain on June 23, 2013. A few days ago, a KKK member and his accomplice were arrested for their roles in a plot to build a portable x-ray machine that they hoped to use to murder Muslims. 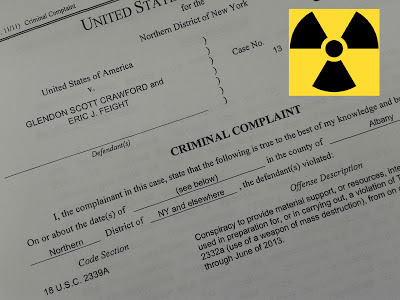 Their plan, which is detailed in the 67 page FBI warrant (see full text of the warrant at the bottom of this post), was to expose their victims to doses of radiation that would lead to their death in a matter of days. Over the course of a year, Glendon Crawford and Eric Feight worked to acquire x-ray tubes, develop software, and build a remote triggering device to allow them to operate an truck- mounted x-ray source from nearly a half mile away. But is it possible, and feasible, to build such a device? That is the subject of today's Fermi Problem. About once a decade, thousands of scientists gather together to figure out what's next for high energy physics. The meeting is called Snowmass (named after the ski resort where it used to convene) and it more or less brings everyone up to date and sets the agenda on everything from project budgets to new searches for dark matter and exotic particles. This year, one of the groups is putting together plans for a particle accelerator nearly four times bigger than the colossal one just finished in Switzerland. At 100 kilometers around, the proposed Very Large Hadron Collider would be seven times as powerful CERN's LHC and could usher in a new era of particle physics. It would also be huge. 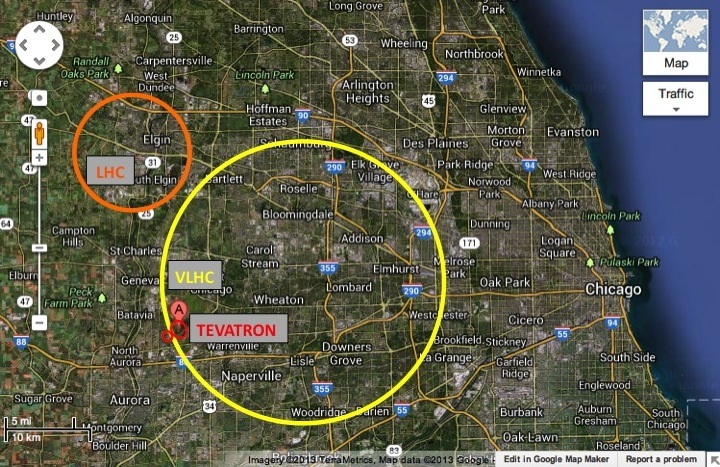 The proposal is to build it based around Fermilab's now defunct Tevatron. Of course it would stick out from Fermilab's campus a bit. Depending on how it's oriented, it could reach all the way to O'Hare airport. This week on the Physics Central Podcast I'm talking about cheetahs, which have long been admired as the fastest land animals on Earth. But new research shows that speed isn't the big cat's secret to great hunting; it's acceleration. What's the difference? For that we turn to physics! Listen to the podcast to learn more. There's videos too! Just look below the fold. A Canadian company is fighting counterfeiters by employing one of the most sophisticated structures in nature: a butterfly wing. To be precise, Nanotech Security Corp. in Vancouver is using the natural structure of the wings of a Morpho butterfly, a South American insect famous for its bright, iridescent blue or green wings, to create a visual image that would be practically impossible to counterfeit. The technology was developed at British Columbia’s Simon Fraser University, and licensed to the company. With over 1.7 billion downloads, the suite of Angry Birds games has dominated the mobile gaming market for the past few years. During the game's meteoric rise, one science writer has taken a keen interest in the physics behind this game. Physics professor and Angry Birds aficionado Rhett Allain has been blogging about the physics behind the various angry birds with his motion-tracking software and physics know-how. Now, he's written a book to boot! 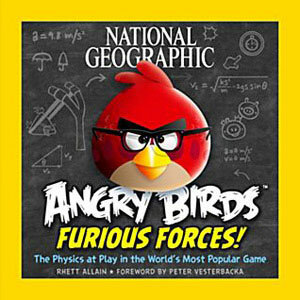 But Allain's new book, Angry Birds Furious Forces!, takes a different approach than many of his blog posts. 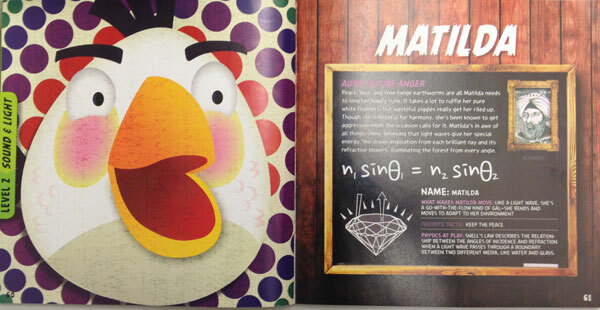 Instead of providing the detailed analysis of his blog posts, Allain incorporates the Angry Birds universe to teach five basic areas of physics: mechanics, sound and light, thermodynamics, electricity and magnetism, and "particle physics and beyond." Nonetheless, this book only vaguely resembles a physics textbook. It's full of bright graphics, costumed Angry Birds, and a few of National Geographic's iconic photos overlaid with some Angry Bird Photoshop magic. Consequently, I found myself breezing through the five sections of the book fairly quickly. The heart of each section covers a few basic physics principles such as circular motion, the Doppler effect, and the speed of sound. Nearly every page is also littered with fun facts (e.g. "salted ice can be cold enough to 'burn' your skin) and related experiments you can do at home. Profile Page for Matilda, the explosive-egg-dropping bird. I started this post yesterday thinking this would be a simple, interesting math problem. Turns out I was wrong. Here it is, a day late and one equation short. This past Sunday I participated in the Great Chesapeake Bay Swim. It's a swim that starts on the western shore of the bay at Sandy Point State Park and ends 4.4 miles later on the eastern shore at Hemingway's Marina. The rules are simple, get in the water and swim to the other side while staying between the spans of the Chesapeake Bay Bridge. The Bay Swim is an Annapolis tradition and has been going on for 22 years. The currents make it a very challenging course, meaning that by the time I'd finished I'd most likely swum farther than the 4.4 miles of the bay. I also had to constantly change my swimming angle with respect to the shore to make sure I didn't get sucked out to sea. After recovering from the "race" I wanted to go back and find out 3 things; the angle at which I should have been swimming to go forward but not get swept out, how far I actually swam, and if I was doing this perfectly, how long should it have taken me. So here are my calculations. Hopefully this will be useful to someone next year! This week on the Physics Central Podcast we're talking about the physics of vinyl records. 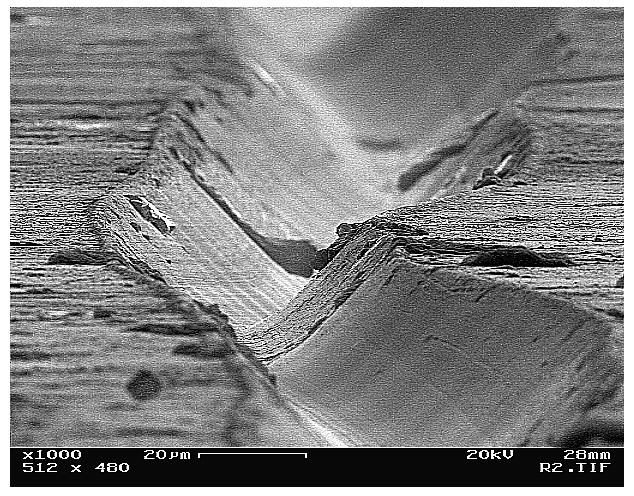 How do records record sound, and why can't you make a record out of wood or ice or some other material? (A: You CAN! It just might not sound very good!). The physicists of yesteryear were a colorful bunch, often dabbling in one discipline for a time before jumping into something entirely new. To many, the bongo-playing, safe-cracking, Nobel Prize-winning Richard Feynman is the quintessential renaissance-man scientist. There were others. 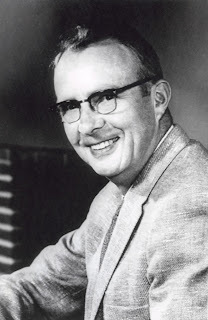 One of Feynman's contemporaries, Luis Alvarez was the man who could seemingly build anything. He was everywhere and played an important role in a surprising number of the big physics discoveries during the middle of the century. Last week, the Guardian published several articles revealing an extensive, intrusive monitoring program hosted by the National Security Administration. Apparently, the NSA has required cell service provider Verizon to hand over huge troves of data covering all of its customers — data including call times, call recipients, and the length of conversations. 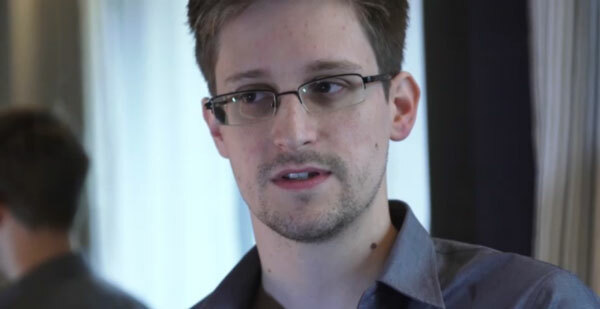 Edward Snowden, NSA Whistle Blower. The source of the top-secret information remained anonymous at first but revealed himself yesterday as Edward Snowden, an IT contractor working for the NSA. Snowden's revelations has galvanized many U.S. citizens to rally against the NSA's program, and Snowden has surely made some new enemies working for U.S. intelligence agencies. 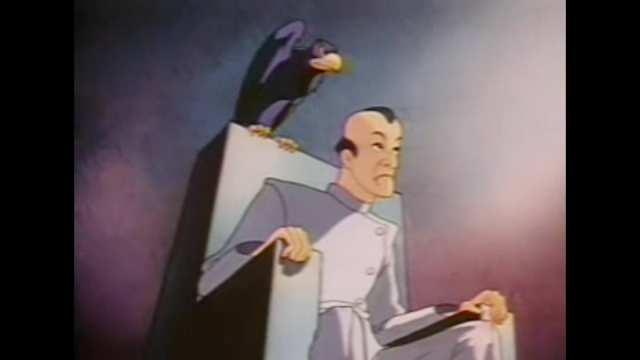 As of yesterday, Snowden's future remained uncertain while he stayed in a luxury hotel in Hong Kong. 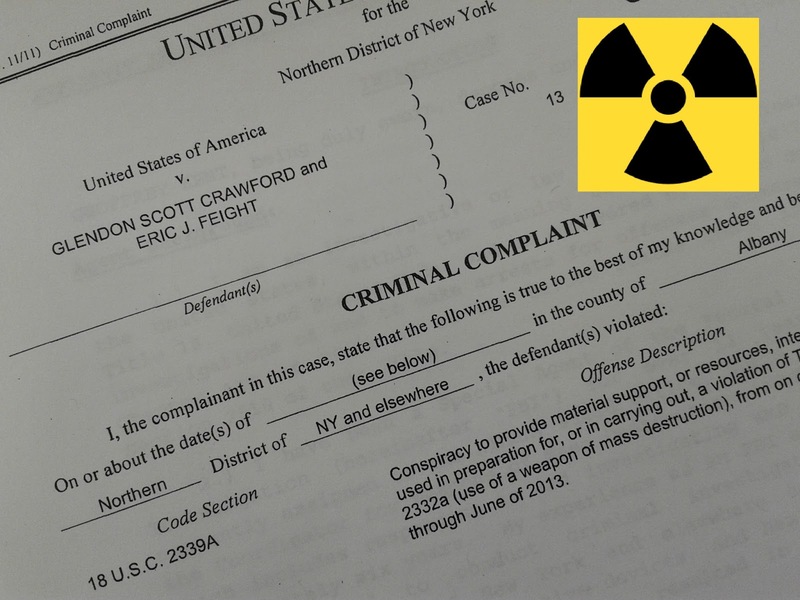 In light of Snowden's actions, I decided to look back at two curious whistleblowing cases from the world of science: one involving a clandestine nuclear program and the other surrounding biotechnology price-fixing. Sunday's Game of Thrones episode, "The Rains of Castamere," sent everyone who hadn't read the books into a tailspin. There won't be any spoilers from Sunday in this post because if the great wide internet can keep a secret for 13 years, its not going to be spoiled here. Since no one can seem to get this recent episode out of their minds, might as well add some physics. There have already been great articles about the "ice" part of A Song of Ice and Fire, but not many about the fire. Particularly the mythical Dragonfire. We learned this season that "dragon glass" can kill White Walkers. In previous seasons it was revealed that Harrenhal is in ruins because of dragonfire. How hot does dragon fire have to be? What makes dragon glass so special? Could Daenerys's dragons attack the Red Keep of Kings Landing now even though they are small? The cores of black holes may not hold points of infinite density as currently thought, but portals to elsewhere in the universe, theoretical physicists say. A black hole possesses a gravitational field so powerful that not even light can escape. A black hole generally forms after a star dies in a titanic explosion known as a supernova, which crushes the remaining core into dense lumps. Last week, the Oklahoma City area was hit with a tornado that claimed 18 lives, including those of two veteran storm chasers. 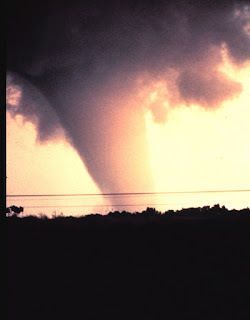 The tornado came only a few weeks after 24 people were killed by a tornado that hit Moore, Oklahoma on May 20th. Tornados are more common in the central part of the United States than anywhere else in the world. How do these natural monsters form, and what do scientists need to know to keep people safe from them? This week on the Physics Central podcast we talk to Harold Brooks, a research meteorologist at the National Oceanic and Atmospheric Administration (NOAA) National Severe Storms Laboratory in Norman, Oklahoma. Brooks shares with us the physics behind tornado formation, the many ways that scientists try to gather data on these rare and unpredictable events, and what they hope to learn about them in the future. At 1:00pm on Tuesday, June 11, 2013. 20 Rockefeller Plaza, New York NY. The Quantum Bank will open for business. The installation is the brainchild of the conceptual artist Jonathon Keats. For Keats, whose previous work includes: copyrighting his brain and auctioning futures contracts on his 6 billion neurons; a stint in extra-dimensional real estate -- in one day he sold 172 extra-dimensional Bay Area plots in the multidimensional space-time proposed by string theory; photosynthetic gastronomy that looks more like a plant watching television; and an attempt to engineer God (or, rather, something more God-like) starting with cyanobacteria and the fruit fly -- the quantum bank plays the market with the science of uncertainty. Keats's theoretical foundation for quantum banking comes from Schrödinger's cat. In 1935, Edwin Schrödinger proposed a thought experiment to illustrate the apparent conflict he saw in the theory quantum mechanical superposition. In his famous thought experiment, Schrödinger proposes a cat is trapped in a steel box with a vial of poison and a tiny sample of radioactive material. If an atom of radioactive material decays (a quantum mechanical process), the poison will be released and the cat dies. One could assume that if no radioactive atom decays, the cat is still alive. The quantum theory of superposition stipulates that quantum events have definite values only when they are observed. Schrödinger argued that if at any moment it were equally probable that an atom had decayed and had not decayed, then the cat too would be in a superposition of alive and dead so long as the box remained closed. Jonathon Keats's quantum banking extrapolates Schrödinger's cat to Schrödinger cash. Accessed by the Quantum ATM, the Quantum Bank will open with seven billion accounts. One for every person on the planet, according to Keats. Anyone will be able to deposit any amount of any currency in the Quantum Bank. Inside the Quantum ATM, a tiny uranium glass sphere is imbedded in a grid of seven billion boxes. Each box corresponds to one of seven billion quantum bank accounts uniquely identified by their coordinates. When one dollar is deposited, the uranium will emit an alpha particle. The dollar is deposited into whichever box the alpha particle passes through and there is now one dollar in that account at the Quantum Bank. However, Keats isn't planning on counting his pennies. Much like putting the cat in a metal box, Keats is encasing the ATM in metal and preventing any measurements. If no measurement is made as to which box the alpha particle passes through, the quantum regime prevails: the particle will pass through all seven billion boxes. All seven billion accounts will be credited -- in a quantum superposition of cash, and no-cash. As Keats writes, "Anyone will be able to claim a free account, sharing as much of their wealth as they wish or simply living off others' quantum deposits." Of course, all withdrawals will be in quantum banknotes -- a currency that can be used anywhere, provided they are accepted. 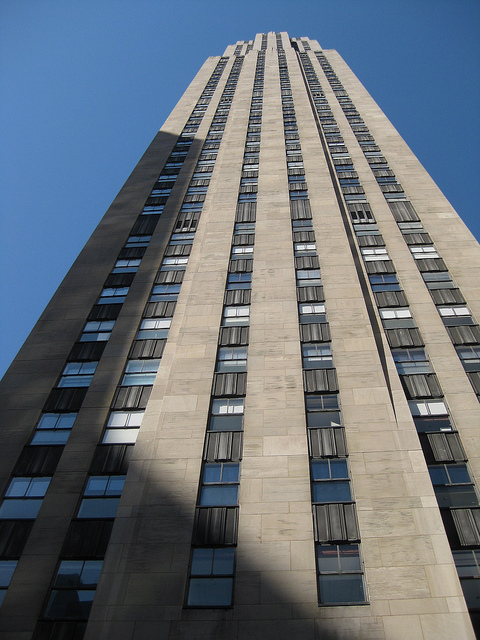 "Crucially," Keats writes, "[the Quantum Bank] will be a paragon of ethical business. Unlike most banks which are backed by faith, the Quantum Bank will be backed by physics. And the new economy that the Quantum Bank facilitates will subsist in a quantum-economic superposition." Though Keats's installation may not be an economy to bank on, his project provokes current ideological economic questions. Seated in the heart of the financial industry, the Quantum Bank will be open to the public until June 14th asking those who dare deposit, what is the reality of the dollar in our post-recession bitcoin-banking world? Quark Twain would like to thank her colleagues at APS and Physics Central for a lovely tenure writing for the Physics Buzz Blog. For more, follow Quark Twain's tweets! Cells form crystals to store nitrogen when life gets tough. Millennium Island in the South Pacific Ocean formed from a number of smaller islets built on coral reefs. (ISNS) -- All over the world, coral reefs, the elaborate graceful structures that serve as the infrastructure of tropical sea life, are turning a deathly white, bleached of all life, mortally wounded. When reefs die, the metropolis of teeming life that surrounds them disappears.